Board the boat outside of peak times to enjoy a more relaxed experience and avoid boarding at the Eiffel Tower stop - The busiest point on the route. We are comparing Seine River Hop On Hop Off Cruise Paris Prices from leading ticket suppliers and Try to find you Cheap tickets prices on the market. A modern, clean and comfortable glass-covered river boat that cruises up and down the River Seine between the Eiffel Tower and Champs Elysées with 8 stops on the route in total allowing passengers panoramic views of Paris's most iconic riverside attractions. The River Seine has been awarded UNESCO World Heritage Listed status for its stunning scenery. A simple way to move around the top riverside attractions in Paris whilst enjoying the panoramic views. Great for travellers who like to sightsee independently and make their own itinerary up as they go along without feeling rushed by tour guides or time restrictions. There is no commentary onboard so this boat cruise might not be suitable for first-time visitors and people wishing to learn all about the sights they are passing on the way. You cannot board the boat with luggage so the shuttle should not be used on transfer days when travelling to/from the airport etc. Your Experience With Seine River Hop On Hop Off Cruise Paris? 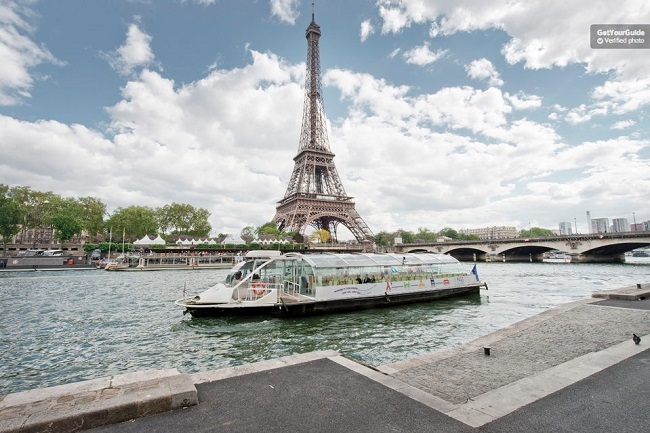 Hop on the shuttle boat at any one of the six stops you choose, find a sit and relax as you watch the beautiful scenes of Paris pass you by on this glass covered boat. You can do a round-trip which will take between 1.5 - 2 hours passing by The Eiffel Tower, the Louvre, Notre Dame, Champs Elysees, and many more iconic sights or, you can hop on/off at any of the 8 stops to go sightseeing, rejoining the boat later in the day at the same stop or any of the other stops. The ticket gives you unlimited travel on a 1 day pass so you can easily do sightseeing during the day, use the boat to get back to your hotel in the late afternoon, get dressed up for the evening and hop on the boat again to take in the sunset views, stop off to enjoy dinner and drinks somewhere and then get back on the boat to see the city of Paris all lit up at night as you make your way back to your accommodation. What Seine River Hop On Hop Off Cruise Paris Includes? Map of the route with stops and nearby landmarks. Tour Eiffel - Port de la Bourdonnais. St-Germain-des-Prés - Quai Malaquais. Near the Institut de France. Jardin des Plantes - Close to Pont d'Austerlitz. The Louvre - Between Pont Royal and Pont du Carrousel. Musée d'Orsay - Quai de Solférino. Notre-Dame - Quai de Montebello. Hotel de Ville - Close to Pont d'Arcole. Champs-Elysées - Close to Pont Alexandre III. The 2 day pass costs just 2 euros extra. Stand at the back of the boat - On Summer days it's cooler and you can enjoy the breeze. Some boats have vending machines onboard. Travelers Reviews about Seine River Hop On Hop Off Cruise Paris? Travellers talking about this river cruise on Trip Advisor, GetYourGuide, and Trip Advisor all agree that it's a great way to move around the top attractions of Paris whilst enjoying the views from the river. They say that the boat is clean and comfortable and it's easy to follow the route on the free map given when you board and to locate the next stops as well as find the well-marked stop when you want to re-board. In their own words, travellers say; "A convenient way to see some sights and not be hit with exhaust fumes" "I love this attraction I hop on this boat each time I go to Paris it's such a comfortable and cool way to have a look at the city. I totally recommend it." "A convenient way to see some sights and not be hit with exhaust fumes!" Travellers also agree that the service is well run and organized with frequent services which are only delayed due to heavy river traffic or bad weather. Printed tickets and e-tickets are accepted onboard. The Jardin des Plantes stop is closed during the Winter season. There is airport-style security screening at each dock. Luggage of more than 16 litres in size is not permitted. You'll need to exchange your voucher for a ticket at the ticket office at any of the 8 stops before boarding. River Seine - Any of the 8 stops listed.